A moratorium on new applications for licensing RRBS is in place (see Consultation on Repurposing the 600 MHz Band ). This Standard Radio System Plan (SRSP) replaces SRSP-300.512, issue 1. Issue 2 of SRSP-300.512 is hereby released in order to remove references to the 614-698 MHz frequency band as per the policy decision in SLPB-004-15, Decision on Repurposing the 600 MHz Band . 1. This Standard Radio System Plan (SRSP) states the minimum technical requirements for the efficient use of the UHF (ultra high frequency) television broadcasting bands by point-to-multipoint remote rural broadband radio systems (RRBS) in the fixed service. 2. The frequency band 512-608 MHz has been licensed for RRBS. 3. This SRSP specifies system characteristics relating to efficient spectrum usage only and is not to be regarded as a comprehensive specification for equipment design and/or selection. 4. RRBS is for fixed wireless accessFootnote 1 only and can be used only for subscriber-based broadband Internet applications. In-band backhaul and other subscriber-based services are permitted at the discretion of Innovation, Science and Economic Development Canada's (ISED) regional office, on a case-by-case basis, provided that the main application of the network is broadband access. 5. RRBS will be licensed on a first-come, first-served (FCFS) basis. 6. This document replaces SRSP-300.512, issue 1, Technical Requirements for Remote Rural Broadband Systems (RRBS) Operating in the Bands 512–608 MHz and 614–698 MHz (TV Channels 21 to 51) . 7. Existing RRBS operating in accordance with GL-05 and licensed as standard prior to the issuance of this SRSP may continue to operate as previously licensed, although RRBS systems operating in the repurposed 600 MHz spectrum are subject to displacement as per SLPB-004-15, Decision on Repurposing the 600 MHz Band . New RRBS must conform to the requirements of the latest version of this SRSP. 8. Radio systems conforming to these technical requirements will be given priority in licensing over non-standard radio systems operating in this band. 9. The arrangements for non-standard systems are outlined in Spectrum Utilization Policy, SP Gen, General Information Related to Spectrum Utilization and Radio Systems Policies . 10. Although a radio system may conform to the requirements of this SRSP, modifications to that system may be required whenever harmful interferenceFootnote 2 is caused. 11. ISED expects licensees to collaborate to resolve conflicts (i.e. interference) through good faith discussions and mutual agreement between the affected parties. If such interference cannot be resolved, the parties should advise ISED. Following consultation with these parties, ISED will determine the necessary modifications to resolve the conflict. 12. ISED may require RRBS applicants and/or licensees to use receiver selectivity characteristics that provide rejection of harmful interference. 13. It should be noted that RRBS operate in accordance with RP-006, Policy for the Use of 700 MHz Systems for Public Safety Applications and Other Limited Use of Broadcasting Spectrum and, as such, may not constrain the provision of existing and new broadcasting services. RRBS are established on an unprotected basis with respect to all TV broadcast services (including low power TV and very low power TV), but not with respect to other secondary services, other RRBS or licence-exempt systems. Should an RRBS assignment established in accordance with this SRSP cause interference to broadcasting assignments, whether established before or after the RRBS assignment, remedial measures will have to be taken by the RRBS licensee even to the extent of ceasing operation if another suitable channel cannot be found. Conversely, an RRBS assignment is not entitled to protection from interference from broadcasting assignments. 14. The current issues of the following documents are applicable. They are available on the Spectrum Management and Telecommunications website. 16. Normally, two channels will be assigned to each frequency division duplex (FDD) system and one channel will be assigned to each time division duplex (TDD) system. However, for each TDD system, up to two contiguous channels may be assigned, and for each FDD system, a pair of up to two contiguous channels may be assigned, depending on the availability of such contiguous channels and provided that the requirement for this extra capacity can be demonstrated. 17. The following section describes radiated power and emission limits for transmitters within the band. 18. The maximum effective radiated power (e.r.p.) of each base station shall not exceed 305 W (equal to an equivalent isotropically radiated power (e.i.r.p.) of 500 W). Safety Code 6 limits must also be taken into account as outlined in CPC 2-0-03. 19. Base stations are subject to antenna height and e.r.p. restrictions as detailed in section 7.2. 20. The e.r.p. of each CPE shall not exceed 2.45 W (4 W e.i.r.p.). 21. The use of higher e.r.p. may be permitted by ISED's regional offices where justified by difficult propagation conditions and provided that it meets the more stringent antenna discrimination requirements described in section 6.2 and that it does not cause interference to TV broadcasting stations. However, in no case will an e.r.p. greater than 24.5 W (40 W e.i.r.p.) be authorized. It should be noted that a CPE exceeding 2.45 W e.r.p. (4 W e.i.r.p.) may cause interference to television receivers that are in close proximity (within approximately 100 m). If this occurs, RRBS operators shall take measures to eliminate the interference, including reduction of the e.r.p. 22. The transmit antenna height above ground shall be limited to less than or equal to 30 m above ground level. The use of higher CPE antenna height may be permitted by ISED's regional offices where justified by difficult propagation conditions and such that no interference is caused to TV broadcast stations. 23. All CPE and RRBS base stations shall meet the out-of-channel attenuation limits specified in RSS-196. 24. The following section describes antenna characteristics. 25. There is no restriction on the type of polarization employed. 26. Both omnidirectional and sectoral antennas may be used by base stations. There is no minimum front-to-back discrimination requirement. 27. The CPE must employ only vertical polarization for transmission, whereas any polarization may be used for reception. 28. The CPE must exhibit at least 14 dB of cross-polarization isolation and a minimum front-to-back ratio of 14 dB. 29. Where the CPE operates at an e.r.p. greater than 2.45 W (4 W e.i.r.p. ), the level of antenna discrimination shall be increased by 1 dB above the value in paragraph 28 for every 1 dB increase in e.r.p. above 2.45 W (3.9 dBW). 30. This section describes criteria for the protection of broadcasting stations. 31. For the purposes of protecting the television broadcasting service from RRBS interference, the contours described in table 2 were established according to the protection ratios noted therein. The protected contours shall be modelled using the F(50,90) propagation curves and terrain models, as referred to in BPR-10. ****	The DTV protection ratios beyond N±1 were linearly extrapolated (in dB) from the values found in table 4.3 of the ATSC Recommended Practice A/74 for the medium and weak desired signal levels. The NTSC protection ratios represent the worst case between the upper and lower adjacent channels for N±1 and beyond. 32. To protect the broadcasting service from RRBS co-channel interference, the RRBS base station must be sited at some distance outside the NTSC/DTV protected contours defined in table 2 in section 7.1. The actual distance is a function of antenna height and e.r.p. as shown in table 3 below. Table 3 was developed as a guide for siting RRBS stations, taking into account the co-channel protection criteria from table 2 and various antenna heights. ISED's regional offices may interpolate between table 3 data points as required. * HAAT is the height of the centre of radiation of the antenna above the average elevation of the terrain between 3 and 16 km from the antenna along a given azimuth in the direction of the nearest affected TV station. ** N/A refers to "not allowed." 33. Table 3 has been calculated using the propagation model found in BPR-10 and according to the methodology shown in annex A. 34. Regional offices may permit, on a case-by-case basis, base stations to have a greater e.r.p. and/or HAAT than shown in table 3 provided there is no interference with TV broadcast stations. For example, regional offices may permit RRBS stations a higher e.r.p. in terrain-blocked circumstances using the methodology shown in annex A, or another accepted terrain-based propagation model. In such cases, ISED may subsequently require compliance with table 3 parameters, if needed, to accommodate new DTV and/or RRBS deployments in adjacent areas. 35. Any RRBS base station must be sited sufficiently outside the protected contour of any NTSC station to protect the broadcasting service from RRBS adjacent-channel interference as defined in table 2. Minimum separation distances for the base station are provided as guidelines in table C1 of annex C.
36. Any RRBS base station must be sited sufficiently outside the protected contour of any DTV station or DTV allotment to protect the broadcasting service from RRBS adjacent-channel interference up to N±2 to the limits defined in table 2, section 7.1. Minimum separation distances for the base station are provided as guidelines in table C2 of annex C.
37. Any RRBS base stations may operate within the DTV protected contour on channel N±3 or beyond. The RRBS operator is responsible for addressing complaints from users of DTV receivers within a distance of 1 km of the base station. ISED strongly recommends that the RRBS operator perform a survey of TV receivers within these radii and consider preventive measures to avoid interference to these receivers. 38. All CPE installations must be sited at least 6 km outside the protected contour of a DTV or NTSC service when operating co-channel (N). 39. All CPE installations must be sited at least 500 m outside the protected contour of a DTV or NTSC station when operating on the first adjacent channel (N±1). 40. All CPE installations must be sited outside the protected contour of a DTV or NTSC station when operating on the second adjacent channel (N±2). CPE installations operating on channels N±3 and beyond may be sited within the protected contour. 41. RRBS licensees are requested, when installing equipment at the customer premises, to survey neighbouring buildings for external TV antennas. In cases where such antennas exist, the licensee is requested to use, to the extent possible, interference mitigating solutions. These may include the use of a directional antenna pointed away from the TV antenna, the incorporation of site shielding, and maximizing the distance between RRBS transmit and DTV receive antenna. 42. RRBS licensees are required to inform their subscribers of the potential for harmful interference to their existing over-the-air television reception. 43. In the event of harmful interference to television reception caused by RRBS CPE, the RRBS licensee shall take measures to mitigate this interference. 44. This section describes methods to mitigate interference to RRBS. 45. As RRBS is a secondary service to broadcasting, there will be no protection from broadcasting stations. As a result, RRBS are subject to potential interference. It is recommended that RRBS operators take the necessary measures to protect their stations from broadcasting station interference. 46. In the event that different RRBS operators in an adjacent or overlapping service are assigned channels in the same or adjacent frequency range, coordination is required. 47. When potential conflicts between systems cannot be resolved, ISED shall be advised. Following consultations with the parties concerned, ISED will determine the necessary course of action. 48. The nominal service contour around an RRBS base station corresponds to a field strength of 30.8 dBµV/m at a receive antenna height of 10 m. The RRBS nominal service contour is calculated using the F(50,90) propagation curves and the terrain-based propagation model referred to in BPR-10. 49. Co-channel RRBS shall not have overlapping nominal service contours. 50. An antenna discrimination of 14 dB is assumed. Also, it is assumed that an omnidirectional receive antenna is used at the base station. The E-field strengths of the co-channel, first adjacent and second adjacent channels shall be calculated using the F(50,10) propagation curves and agreed upon terrain models referred to in BPR-10. 51. If it is assumed that the affected CPE is directed away from the interfering CPE or BS, then a new RRBS shall not create an E-field strength greater than 23.8 dBµV/m+14 dB = 37.8 dBµV/m at the nominal service contour of a neighbouring RRBS, or at an E-field strength greater than 15.0 dBµV/m at a neighbouring RRBS base station, without having coordinated in advance. 52. A new RRBS system shall not create an E-field strength greater than 55.0 dBµV/m+14 dB=69.0dBµV/m at the nominal service contour of a neighbouring RRBS, or an E-field strength greater than 46.1 dBµV/m at a neighbouring RRBS base station operating on N±1, without having coordinated in advance. 53. A new RRBS shall not create an E-field strength greater than 77.6 dBµV/m+14 dB = 91.6 dBµV/m at the nominal service contour of a neighbouring RRBS, or an E-field strength greater than 68.6 dBµV/m at a neighbouring RRBS base station operating on N±2, without having coordinated in advance. 54. Refer to annex B for guidance on the derivations of the E-field strength levels in 9.2.1, 9.2.2, 9.2.3, and 9.2.4. Note that annex B does not include any CPE antenna discrimination. 55. In the border area, the sharing and use of the bands 54-72 MHz, 76-88 MHz, 174-216 MHz, 470-608 MHz and 614-746 MHz are currently covered by the Agreement Between the Government of Canada and the Government of the United States of America Relating to the TV Broadcasting Service and the Associated Working Arrangement , the Letter of Understanding (LOU) , which covers areas within 400 km of the border, and the Interim Agreement Between Canada and the United States Concerning Digital Television (DTV). These three agreements and working arrangements deal with the sharing and use of the bands by broadcasting services operating in the United States and in Canada. In addition, the LOU specifies that new (non-broadcasting) services shall not claim protection from DTV stations or analogue TV stations in either country. The LOU does not deal with non-broadcasting versus non broadcasting operations in the border area. Therefore, until such time as a new Agreement can be reached between Canada and the United States, any authorization issued for non-broadcasting use in Canada within 400 km of the border area must be on a no-interference, no-protection basis with respect to broadcasting services in the United States. Furthermore, licensees will be subject to any future agreements or arrangements between Canada and the United States regarding use of these RRBS in the border area and may be required to modify their stations or operations in order to conform to such agreements or arrangements. 56. Until a new Agreement is reached, RRBS stations are not permitted to operate within 121 km of the Canada-United States border. At this time, ISED will not accommodate nomadic or portable systems under RRBS. For the purpose of this SRSP, "harmful interference" means interference that endangers the functioning of a radionavigation service or other safety services or seriously degrades, obstructs, or repeatedly interrupts a radiocommunication service operating in accordance with regulations and technical requirements laid down by ISED under the Radiocommunication Act . This annex describes the method for calculating the required separation distances between broadcasting and RRBS base stations. • The spectral density of RRBS is similar to that of DTV, i.e. uniform density and occupying the entire 6 MHz channel. F/B RRBS is the antenna (RRBS receiver front-to-back ratio in dB (assume F/BRRBS = 14 dB for CPE and F/BRRBS = 0 dB the base station)). 2. Using the broadcast protection criteria for each broadcasting station, the maximum undesired field strength (U) is calculated using Equation (A1). 3. The location of the broadcast protected contour is calculated using procedures specified in Broadcasting Procedures and Rules, Part 4 (BPR-4, Application Procedures and Rules for Television Broadcasting Undertakings ) or Part 10 (BPR-10, Application Procedures and Rules for Digital Television (DTV) Undertakings ). 4. Using the RRBS parameters, including e.r.p. and HAAT, the corresponding distance to the protected contour shall be obtained using the F(50,10) propagation curves in BPR-10 and the maximum undesired field strength (U). 5. Figure A1 below demonstrates the applicable antenna front-to-back ratio that may be applied between broadcasting and RRBS base stations and the customer premises equipment (CPE), where Bsd is the separation distance from the base station to the protected contour, and Csd is the separation distance from the CPE to the protected contour. 6. 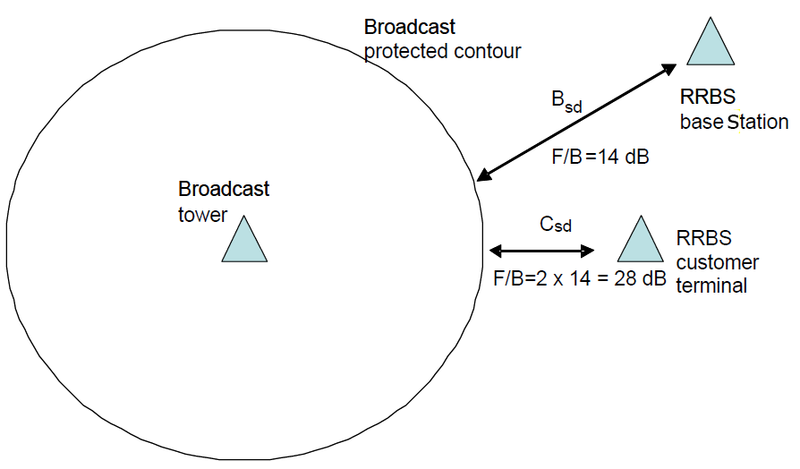 The distance between a broadcasting station and an RRBS base station is the sum of the distance from the broadcasting station to the protected contour (Step 3) and the distance from the protected contour to the RRBS station (Bsd or Csd). This is a diagram of a typical deployment configuration and is used to illustrate the parameters used in the calculations in annex A. The diagram consists of a broadcast tower located in the centre of its protected contour. The RRBS base station is located outside of the broadcast protected contour at a distance of Bsd. In this case, the front-to-back ratio, F/B, is assumed to be 14 dB since it is due entirely to the television receive antenna. The nearest RRBS customer terminal associated with the RRBS base station is also located outside of the broadcast protected contour at a distance of Csd. This is typically a shorter distance than Bsd. In this case, the F/B is assumed to be 28 dB due to the combined discrimination of the RRBS customer antenna and the television receive antenna. This annex provides guidance on the derivation for calculating the minimum E-field strength levels to coordinate between RRBS. The RRBS CPE receiver protection is defined using a minimum co-channel C/I ratio of +4 dB,Footnote a which is equivalent to the minimum required signal-to-noise ratio (SNR) for robust RRBS operation. The first adjacent channel CPE receiver rejection is 41.0 dB, whereas the equivalent first adjacent channel rejection resulting from the transmit emission mask described in RSS-196 is 31.7 dB, resulting in a compound rejection of 31.2 dB. The second adjacent channel CPE receiver rejection is 63.2 dB, whereas the equivalent second adjacent channel rejection resulting from the transmit emission mask described in RSS-196 is 54.3 dB, resulting in a compound rejection of 53.7 dB. The compound effect is assumed to be a power addition of the interference resulting from the two interference mechanisms: leakage of the RRBS main interfering signal into the victim receiver due to limited receiver filtering performance, and out-of-band power emitted by the interfering RRBS transmitter into the channel selected at the victim RRBS receiver. Typical CPE parameters and calculated values for the maximum non-interfering field strengths for co-channel, first adjacent, and second adjacent channels may be found in table B1. These values are based on Equations (B1), (B2), and (B3). FSCPEMAXco is the maximum non-interfering field strength for co-channel in dBµV/m. FSCPEMAX1 is the maximum non-interfering field strength for the first adjacent channel in dBµV/m. FSCPEMAX2 is the maximum non-interfering field strength for the second adjacent channel in dBµV/m. The RRBS base station receiver protection can be defined using a minimum co-channel C/I ratio of +4 dBFootnote b, which is equivalent to the minimum required SNR for robust RRBS operation. The first adjacent channel base station receiver rejection is 41.0 dB, whereas the equivalent first adjacent channel rejection resulting from the transmit emission mask described in RSS-196 is 31.2 dB, resulting in a compound rejection of 31.2 dB. The second adjacent channel base station receiver rejection is 63.2 dB, whereas the equivalent second adjacent channel rejection resulting from the transmit emission mask described in RSS-196 is 54.3 dB, resulting in a compound rejection of 53.7 dB. The compound effect is assumed to be a power addition of the interference resulting from the two interference mechanisms: leakage of the RRBS main interfering signal into the victim receiver due to limited receiver filtering performance and out-of-band power emitted by the interfering RRBS transmitter into the channel selected at the victim RRBS receiver. Typical base station parameters and calculated values for the maximum non-interfering field strengths for co-channel, first adjacent, and second adjacent channels may be found in table B2. These values are based on Equations (B4), (B5), and (B6). FSBSMAXco is the maximum non-interfering field strength for co-channel in dBµV/m. FSBSMAX1 is the maximum non-interfering field strength for the first adjacent channel in dBµV/m. FSBSMAX2 is the maximum non-interfering field strength for the first adjacent channel in dBµV/m. This value is based on Quadrature Phase Shift Keying (QPSK) with ½ Forward Error Correction (FEC) at the edge of coverage. These sample values are based on the protection ratios in table 2 and were calculated using the methodology in annex A. In lieu of using these separation distances, licensees — in consultation with and agreement from ISED's regional offices — may recalculate the required separations using site-specific information and agreed terrain databases, using the terrain-based propagation model found in Broadcasting Procedures and Rules, Part 10, Application Procedures and Rules for Digital Television (DTV) Undertakings (BPR-10). Table C1 provides the minimum separation distances outside the protected contour of an NTSC broadcast station for an RRBS base station or CPE when using co-channel (N), first adjacent channel (N±1) and beyond (N±2 to N±4, N±7 to N±8, N+14 and N+15). Table C2 provides the minimum separation distances outside the protected contour of a DTV broadcast station for an RRBS base station or CPE when using co-channel (N), first adjacent channel (N±1) and second adjacent channel (N±2).